Palatine Park District presents the 21st annual Fall Festival on Saturday, October 13 from 11:00am to 4:00pm at Palatine Stables, 1510 W. Northwest Highway, in Palatine. This family-friendly event includes a wide variety of fall activities for the entire family. Admission and parking are free, fees apply for some activities, and dogs are not allowed. For a complete list of the day’s events, visit the Fall Festival event information page. 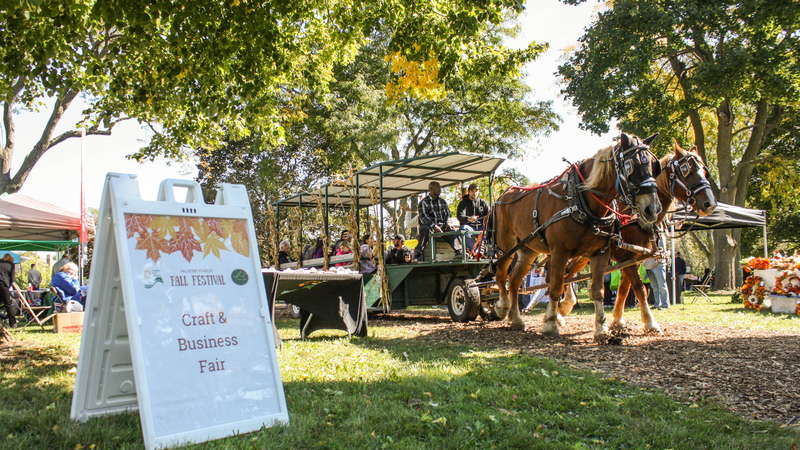 Activities include a petting zoo, wagon rides, pony rides, make and take crafts, riding demonstrations by the Palatine Stables Show Team, a kid’s zone with bounce houses and games, seasonal craft vendors, sponsor booths, and live entertainment. The Meadowlark Stage will offer free entertainment throughout the day including concerts by Miss Jamie’s Farm, Istvan and His Imaginary Band, and Mr. Adrian & Friends. Concessions will be available for purchase from Palatine Park District’s Stableside Café including Morkes Chocolates, Chick-fil-A Kildeer, and Pizza Bella. The 5th annual Scarecrow Contest will be held from 11:00pm to 3:00pm. For $10, participants will be given a scarecrow frame, a small burlap sack, and a bag of straw. Additional clothing and decorating items will be available as well, or decorations and clothing can be brought to the event. Awards will be announced at 3:45pm, and prizes will be awarded for the 1st, 2nd, and 3rd place scarecrows. Scarecrows can be taken home at 4:00pm by the groups that created them. In the event of inclement weather, most activities will be moved to the barns. For more information on the Fall Festival or Palatine Stables, contact Toni Bruns, Stables Manager/Trainer, at 847.359.0009 or tbruns@palatineparks.org. This year’s Fall Festival has been made possible through partnerships with a variety of community businesses including our Presenting Sponsor: Grade Power Learning of Palatine. The following Gold Level Sponsors: Andigo Credit Union, Berkshire Hathaway HomeServices-Sue Gould, Chick-fil-A Kildeer, Daily Herald Media Group, Morkes Chocolates, Orthodontic Experts, Pizza Bella, Plum Creek Supportive Living, SportClips-Palatine, The Playground Games, and Zeigler Chrysler, Dodge, Jeep, Ram of Schaumburg.